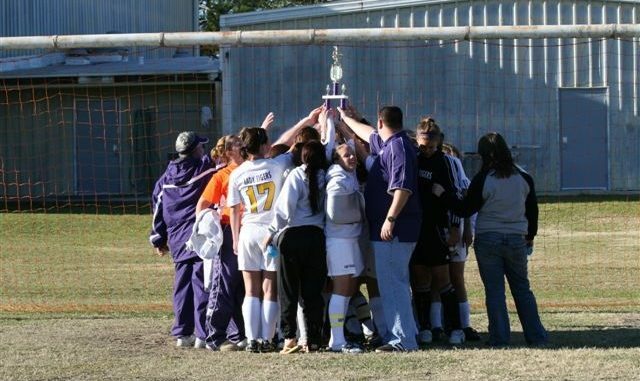 Eight teams from across the region competed in the annual Battle on the Bayou tournament last weekend.And it was the Hahville High School Lady Tigers who fought their way to the final match up and brought home the trophy. Lady Tiger Coach Shaun Crochet says that winning such a competitive tournament is a morale booster for the girls. Crochet adds that winning the Battle on the Bayou amidst a strong field of competition will help build the team’s confidence leading up to district play. The two-day girls soccer event took place on Dec. 6 and 7 at the J.B. Martin/R.J. Vial Soccer Complex in Paradis. HHS kicked off the tournament with a 7-0 win against the Beau Chene Lady Gators. Three goals were scored by Annie Kinler, and Arden Robert, Jessica St. Pierre, Brandie Fabre and Ashley Hartman each scored one goal against their opponent. Lady Tigers defenders Leslie Jefferson, Jenessa Duncan, Kayleigh Eppling, Jessica Donnaud, Claire Crutti, Devin Durapau and Brandi Soignier along with goal keepers Destiny Louviere and Alyssa Fournier allowed Beau Chene zero shots the entire match. Despite out shooting the Cabrini Lady Crescents 14-3, game No. 2 proved to be a much tougher match up and neither team scored any goals. Timely defense was led by Donnaud, Jefferson, Duncan and Eppling, with Louviere allowing only three shots during the game and securing the shut out. The Lady Tiger defenders remained on point during HHS’ next game against the Woodlawn Lady Panthers. The girls defeated WHS 1-0 with Donnaud scoring the only goal. However, the Lady Tigers had the chance to go up by two goals early in the second half, but Donnaud missed a penalty kick that was awarded for a foul by a Woodlawn defender on St. Pierre. In the final game of the tournament, HHS matched up against the Comeaux Lady Spartans and defeated them 3-2. The girls also won the penalty kick shoot out 4-3. Hahnville led 1-0 at halftime with an early goal scored in the first half on a corner kick by Jefferson. The Lady Tigers went up 2-0 early in the second half with a St. Pierre goal scored from corner kick. Comeaux came back to tie 2-2 by the end of regulation. According to tournament rules, teams are allowed to play a 10-minute “golden goal” overtime period followed by a penalty kick shootout if overtime produces no goals. HHS and CHS defenders played their positions well, keeping each team from scoring any points. Comeaux won the coin toss and kicked first, but after several goals that were sent over the crossbars, Hahnville was named as champion. Penalty kick kickers included Jessica Hartman, Ashley Hartman, Courtney Speice, St. Pierre and Robert. Carrisa Marston scored the championship-winning penalty kick. Crochet says that with the tournament behind them, the girls need to begin focusing on one game at a time, especially their match up against South Lafourche on Friday. “While I think that we are performing OK as a team, we still have a long way to go until district begins,” he continued. “We have to prove to ourselves that we are capable of consistently playing at a high level in order to compete in our district and return to the playoffs, and we’re just not there yet. The Lady Tigers will begin district play on Dec. 30 when they travel to Dutchtown.